Since we are going to be busy for the next couple of weekends, we had to get our apple picking in early. Although it was earlier than usual it was still September. You would never know it but it was SO HOT!! You can see we all had shorts and t-shirts on, but you can't see that we were still sweating. Regardless of the weather, we still had a great time. It helps that we are now professional apple pickers with the kids. We went to Russell Orchards and brought the wagon so we could see it all. We picked 2 bags of apples even though the kids (as usual) ate more than they picked. After apple picking we took the hay ride and saw all of the farm animals they had. But my favorite part will always be the cider and donuts! Since we were in Ipswich, we hit the Chowda Fest after apple picking. It was along the riverwalk and although HOT out, we had so much fun. They had a ton of games and prizes for the kids and delicious clam chowder for the adults. 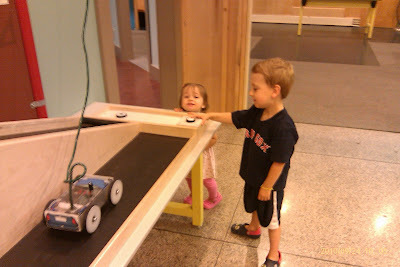 With nothing much to do on this Mommy/Richie/Angela day, we went to the library and found there were still free passes to the Museum of Science. Richie had only been there once and Angela had never been so it was fun. Still way too old for both of them, but they love looking at new things and getting to run around. After having lunch there overlooking the river, we came home to play with the dogs! Maggie spent the weekend with us while Erin and Matt were away. Tonight we did our first preschool project. It was so nice to sit down together, talk and see how much Richie has grown. We had to put our family picture on a leaf that will be hung on a tree at the entrance to school. It prompted discussions about fall and how the leaves change colors and fall off. I can't get over what a sponge they are at this age. Now it would have all been perfect if he hadn't come home and said, "Mommy, the other kids already did their leaves and brought them back to school." WHAT? They didn't tell us when it was due.......we have been busy........already a delinquent mother on week 1 of school. Sigh.....it is going to be a long 12 years of school to come. Oh yeah, and we already have a box of candy to sell. Anyone want some? Candy money is due Friday and we have sold....none. We have eaten some! Double sigh.......I can't imagine how hard Kindergarten will be. Our third annual boys golfing/girls beach weekend!! We didn't think it could happen again, but we had amazing weather. Mid September in Maine and we spent 2 full days in bathing suits on the ocean. My kids clocked an unbelievable number of hours in the sand. They each went in the water and were not fazed by how cold it was. Angela ate her whole lunch covered in sand then proceeded to eat another shovel full to wash it down with. They are our beach babies and now we are thinking maybe we should move to Newburyport. Once again a HUGE shout out to our friends the Shumways for putting us all up in their amazing house. This group isn't easy either having 5 kids among us. They are the best part and they are now becoming best friends. Life is good! Regina sitting in Richie's car seat.....she does this all the time when he isn't in it. She likes to be higher and she just looks out the window. Officially the weirdest dog on the block......good thing we still love her! Angela is growing up so fast! Well we went to see the pediatrician today and he said Angela is perfect! Well we knew that, but it means she is now 15 months old already. She is 21 pounds 8 ounces (25th percentile) and 31 1/4 inches tall (75th percentile). As you can see from one of the pictures below, she doesn't have that "tall and thin" stature (she has a belly and thunder thighs), but hey, those charts have always baffled me. I was going to talk to the doctor about how she doesn't have a lot of words yet, but this morning she repeated doctor and cracker. Not exactly easy words! When we were in the room waiting for the doctor she looked at me and asked, "Doctor"? I was amazed. Needless to say he said it is all fine and a flood of words have come since then. I can just imagine she will be talking up a storm soon and we will wonder why we wished for that day! I can't even believe the day has come, but my little boy went off to "school". We called day care school as well, but this just felt different. Maybe it was the uniform, or because I had to walk him. Maybe it was just that we had talked about it for SO long. Either way, today was a special day in our house. This is the weekend that Donna is away in Portsmouth, NH with her friends so Daddy has decided that updating the blog is another job of his for the weekend. We had a very busy day doing things all around the city and got to finish the day by having dinner with Aunt Erin, Uncle Matt, Grandpa and Nana. This one is going to make Mommy miss her little angel. We had an awesome visit tonight from our friends the Hiltons. Chucky (Elizabeth) is one of our Clarkson friends and she now brings along her beautiful family. Wayne (her husband), Becks (her daughter Rebecca) and Finn (her newest 4 month old - not so little - son!). We miss Chucky so much and wish she wasn't so far away. And Wayne has become one of the guys when he is in town. To welcome their annual visit we had a typical roof deck party with lots of Boston friends. We used to get drunk and eat chicken wings.....now we have a beer (or three) and try to make sure our kids eat something!! Oh the good times! And I had to post these pics as soon as they left because Chucky was giving me so much credit for posting pics ASAP. I couldn't let her down. Love and miss you guys already! FROM DAWN - "Why does Rich put band-aids under his chin??? Who knows, but it is cute:-) Here is a pic of him with his orange seahorse he picked for a prize for reading 7 books! I love the summer book list we do.. I told him Curious George books don't count for Miss Jennifer's book list (I know, I am horrible) and since then, we have only read them about once a week instead of 5 times a day! Score! Here is a pic of Rich and Hunter, Richie's FAVORITE North End Buddy! Also are a few more pics of Rich playing dress up. Angela tried on 2 outfits then wanted nothing to do with it! I think Rich needs dress up clothes that do not involve girl clothes!" There was one dress up picture I just did not have the heart to put online. It involved a tool belt but no clothes. I will save it for when he gets married though!